As the weather begins to turn chillier and our sunburn starts to fade, a lot of us finding out attention turning to heating. It’s no secret that electric heating is more expensive that gas; here in the UK the cost of electricity is 10-15p/kWh and the cost of gas is just 3.5-4p/kWh. Even accounting for the inefficiency of gas, it’s still around 3 times cheaper. That said, there are plenty of homes across the UK without access to gas, and even those that are sometimes find our central heating just can’t provide enough warmth for the chillier times. That’s when it’s time to start scouring the Argos catalogue for an electric heater. The heater running costs below are based on average standard tariff costs (with the exception of storage heaters). The old favourite – the kind you crack out on those cold winter days to warm yours toes. Though super cheap to buy, these kinds of heaters can be false economy depending on the area you’re trying to heat. If the room is not well draft proofed then the hot air being pushed out by this kind of convection heater will simply flow right out of the door. As soon as you turn it off, the warm air will be gone. What you gain in initial savings and immediate heat, you lose in efficiency. 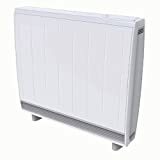 If you’re thinking of getting a heater like this, make sure that all the doors and windows of the room are closed and any chimneys are blocked. This way the room can hold the heat even after you’ve turned it off and the fan heater running costs will be significantly reduced. Oil filled radiators work on the basis that when electricity is passed through it, the fluid expands and gives off heat through the surface of the radiator. Like a traditional radiator, it is this surface temperature that warms the room. 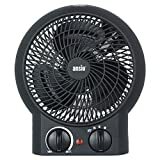 Unlike a fan heaters, which is directional and instantaneous, an oil-based system heats the room more slowly and evenly. It’s a bit less just-got-in-from-the-cold and a bit more pop-it-on-and-settle-down-in-front-of-the-telly. Since it’s just another way of achieving convection heating, the same rules apply as with fan heaters. Keep all draughty areas sealed up and yell loudly at anyone that leaves the door open. You know these, they’re the orange glowing ones you see outside pubs and train stations. While the first two examples operate on convection heating, a halogen heater uses radiant heat to warm you up. This means they skip the step of heating the air and jump straight to heating everything else – you, the walls, the sofa, the pet rabbit. When you’re out on a cold day but can still feel the warmth of the sun, that’s radiant heat. Unlike with convection, you don’t need to worry so much about draughts and open doors. Since radiant heat doesn’t focus on warming the air, it doesn’t matter as much if the air escapes the room. This is why infrared and halogen are used so much in public places, where people and coming and going and it’s difficult to keep the air in. Halogen heaters use the infrared rays in a focused direction, meaning that you don’t need to waste energy and money heating the full room. For this reason, often a lower wattage of heater is needed, saving you money. Much like the halogen heaters discussed above, infrared panels work on radiant heat. It’s essentially the same technology, tweaked slightly. Where as a halogen heater uses ‘near infrared’ technology and has a strong, directional heat, infrared panels are ‘far infrared’. This means they have a much wider dispersal and no glowing elements. They can be place on feet and used portably, but they work best when wall or ceiling mounted. Again, since they don’t heat the air, they’re perfect for draughty spaces and old houses that would otherwise struggle to keep the heat in. Just be careful if your property has a lot of glass in it – glass can’t hold the infrared heat properly so it’s a bit of a no-go. Unlike all the others on this list, a storage heater has two main differences. Firstly it operates on an Economy 7/10 tariff system, and secondly it is in no way portable. This is not the cheapo heater you pick up from Argos, it’s a serious bit of kit. It should note at this point that Economy 7/Economy 10 relies on base load energy generation, which is maintained by technologies being rapidly overtaken in the UK by newer, renewable sources. 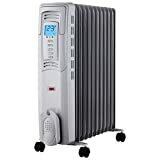 Therefore the tariff basis on which a storage heater saves money may, in a few years time, cease to be an option. They’re big, bulky, expensive to buy, and run the risk of becoming obsolete. That said, they can be fairly cheap to run when used properly, plus a high performance storage heater is still the only electrical heating system that can improve an EPC rating. Electric heater are generally considered to be 100% efficient (give or take a few percent). This is standard, so don’t be impressed by a heater boasting that. Heaters with a timer function can save you a lot of money by curbing your usage. Radiant heat and radiation are not scary words. Infrared and halogen are 100% perfectly safe. Recent legislation was passed to ensure that all space heaters were relatively efficient – all non-compliant models are now out of commission, but may still be for sale. Watch out for these by making sure that whatever you’re buying is Lot 20 compliant. What? Watts. The wattage of the heater is the most simple way to figure out the running cost. Never leave these heaters on overnight. Although all modern space heaters will automatically cut out if they start overheating, it is still both dangerous and expensive to leave them unattended for a long period of time. Don’t believe what any of them say about the size of room they will heat. It is entirely dependent on the size, insulation, and nature of the room, and it’s ability to hold heat. Convection is not nearly as efficient as infrared, but it is a helluva lot cheaper to buy. Hot air rises!! Don’t put a convection heater on a table or raised surface. Keep it on the floor, the warmth will reach you. Know your tariff! Economy 7 is ONLY suitable for storage heaters. I would like some help in finding a solution to my elderly mother’s heating problem. She is 92, and spends most of the day sitting in her chair in her small sitting room. The flat is in a sheltered housing block and the only source of heating they supply is storage heaters. Her previous storage heater kept her warm all day, but became very hot at night (too hot to touch) and was uncomfortable for my sister when visiting to sleep in the sitting room. The Management Company have changed the storage heater to a new, digitally controlled storage heater. This new one doesn’t keep her adequately warm, because, they say the thermostatic control only allows input to be triggered at lower than 20 degrees, and because she needs the room to be much warmer than that until 9 or 10 at night, there is not enough time to sufficiently heat the bricks. Whether this is the problem, or because the new heater is restricted from heating above 25 degrees, I dont know. However, she has been using an expensive electric convection heater while this problem is explored. can you offer any suggestions? You said that infrared is perfect for draughty spaces and old houses but does that mean there is no point in draught proofing if that’s what you’re using? While it’s true that infrared’s primary heat is the effect we’ve discussed above (ie, hitting you with the infrared radiation and warming you that way), it’s also true that there’s a secondary effect by which the warmed objects in turn push that heat back in to the room. That means that draught proofing will still have a positive effect on the overall comfort of the room. Misleading article, why not make the kw and cost to run the same to be clearer. The cheaper to run appliances are actually more expensive. The reason for not doing that is that they would all be the same! Any two 1kw heaters cost the same because they’re using 1kw of electricity. In this article we instead tried to make the comparison between heaters that would provide similar levels of thermal comfort instead. hi there, what about the cost of electric heater compared to gas ?